As of today, I'm the proud owner of a boiled wool collarless coat! I took my time making it, and apart from a couple of niggles, it's more or less exactly as I imagined it would be. It's an open coat i.e. not designed to have fastenings, so it's pretty casual, almost like a long cardigan when worn with jeans. The classic lines means it can also be worn with a skirt and heels and still look good (no photos of it styled this way I'm afraid, but trust me, it looks nice!). 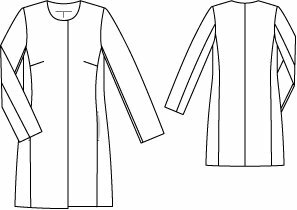 The pattern I used (a Burda PDF which I talk about in this post), was well drafted and I really like the fit of the coat. The instructions, on the other hand, left a lot to be desired. Burda aren't exactly well known for the clarity of their instructions and the lining paragraph made no sense whatsoever! It was pretty easy to work out what to do though, and at a bargainous £3.99, I still think the pattern is good value for money. In terms of fit, I sized down to a 38 everywhere except the bust area (which remained a size 40) as I wanted a slimmer fit, I shortened the arms by 1.5 inches and the overall length by four inches. I also shaved ½ an inch off the shoulder height. This resulted in the sleeve head being a bit too full and puffy for my liking. I knew this would annoy me, so I reduced the amount of ease in the sleeve and redrafted it using this method. A pain to do admittedly, but worth the effort in the end. So what was the boiled wool like to work with? Well, I had high hopes of working with it and it didn't disappoint. As per the advice of my readers and my own list of tips, I used a ballpoint needle, a longer stitch length and a walking foot. The walking foot proved to be an absolute life saver - layers of boiled wool can quickly resemble a shag pile carpet and it really did help chomp through all the layers with ease. It also helped stop the layers shifting about - essential once the silk lining was in place. Because boiled wool is quite a bulky fabric, I top stitched either side of the main seams and trimmed the seam allowances back. I really should have used a pair of duck-billed appliqué scissors for this job (read a great explanation of their use in this post of Kerry's), as I was in serious danger of snipping through the main fabric. In fact I'm amazed I didn't! Stitches do tend to sink into the fabric though, which makes unpicking them a long and tedious process, so it pays to go slowly for an accurate finish. Top stitching everything down also uses a LOT of thread - I went through three spools altogether. 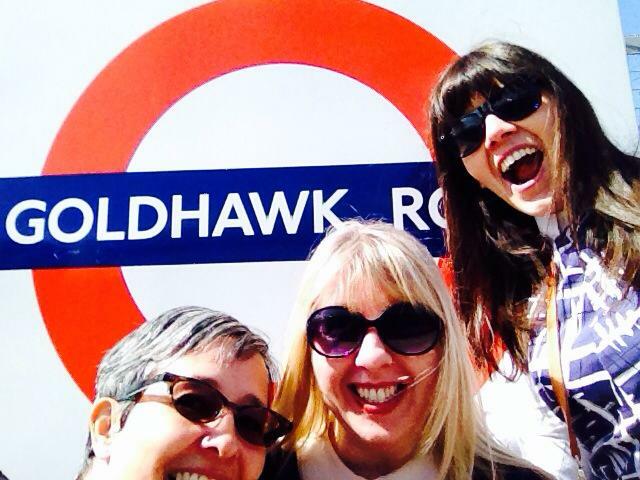 I picked up the lining fabric from Classic Textiles in the Goldhawk Road. It was sold to me as Liberty silk, but unlike the other Liberty silks I could see, there was no Liberty of London mark on the selvedge. My immediate thought was, "Liberty silk, my arse", but I decided to give them the benefit of the doubt and look up the design. Imagine my delight when I found it actually was a Liberty Silk! The design is called Kilburn Rose and it's part of a 2013 range designed by actress Tamsin Grieg! Whoops, soz for doubting you Classic Textiles, I take it all back! I love the colours in the lining - they complement the blue of the boiled wool perfectly - and the vintage style of the roses are so me. I should have guessed it was a Liberty fabric as it was such a pleasure to work with, it doesn't fray much and has a beautiful, silky drape to it. At £12 a metre, it's more than I would normally pay for a lining fabric, but for Liberty silk, it's a bargain. I only needed 1.5 metres so I think the investment was worth it. To make the sleeves easier to slide on and off, I lined them with plain green lining fabric, which, in comparison, was a complete nightmare, forever fraying and sliding around! Aside from the main fabrics, I used a washable supersoft interfacing from The English Couture Co on the facings, and stay tape on the neckline, shoulders and armholes to prevent them stretching. I also added a couple of sew-on press studs to the front of the coat - I'm not sure if I'll need them but at least they're there if it gets windy! 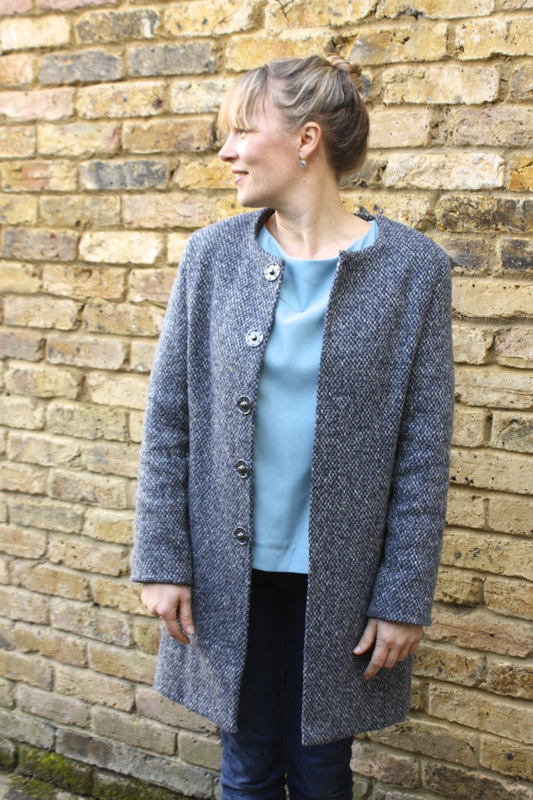 I barely used the iron whilst making this coat as I was scared of stretching the wool, I found that finger pressing the seams into position before top stitching was all it took. It's an almost perfect make: one of the sleeves drags up at the back slightly where I've attached the lining, and the top and bottom of the facings misbehave a bit. No amount of restitching seems to make any difference, so I'm just going to forget about them. I still have a gorgeous, warm, classic coat that's going to get a LOT of wear. Coat fabric was given to me free of charge for review. All views my own. I'm delighted (and a tiny bit scared!) 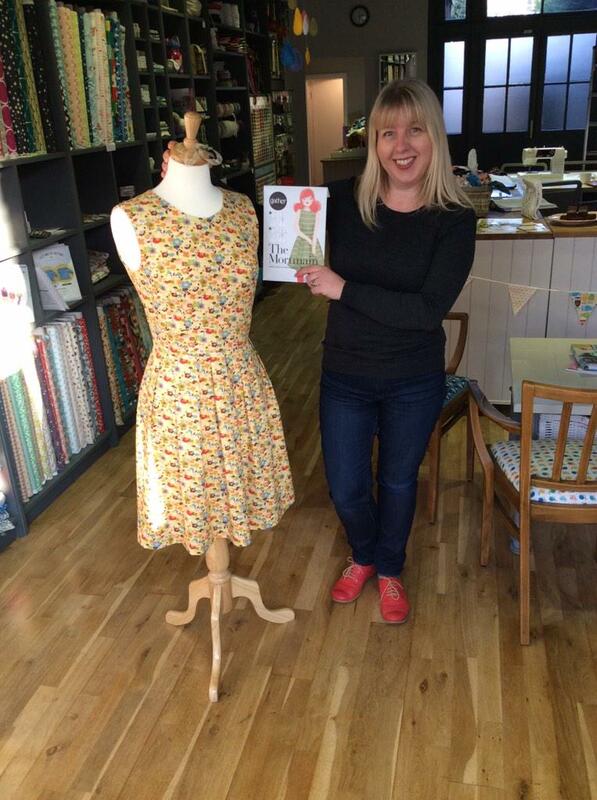 to announce that I'll be teaching a Mortmain dressmaking class at Badger & Earl in Chiswick. Yayyyyy! The class will run on two consecutive Sundays in March (15th and 22nd), where I'll guide you through each step of sewing up the sleeveless version of this lovely, vintage-inspired dress. Further class details and booking information can be found here. I recently taught a one day PJ bottoms class at Badger & Earl for 12 year old girls, which was so much fun. Now I get to do it again, with one of my favourite patterns! I've made the Mortmain dress twice now, once for myself (my lemon dress) and once as a sample for the class. For those who were interested in the fabric I used for the sample, it's Poppin Poppies in clover, which is part of the Avant Garden range by Momo. The Village Haberdashery still have it in stock here. The Mortmain dress is a classic shape with a fitted, darted bodice, separate waistband and box pleated skirt. It also features an exposed zip to the back. Some of the techniques involved are a little involved, so I'd say the class is suitable for an ambitious beginner. 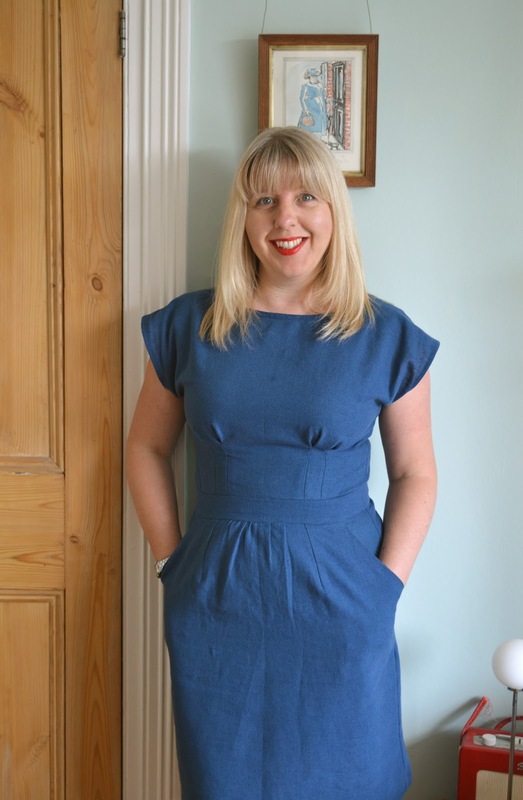 If you already have a couple of simple dressmaking projects under your belt and are looking to expand your skills, then this could be the perfect class for you. My legs aren't really that short - it's the camera angle! For the past week I've been making another Mortmain dress by Gather Kits. This time round though, it's not for me - it's a sample for Badger and Earl, to publicise a future Mortmain dressmaking class. My brief was to sew it up exactly as instructed in the pattern, but once I was making it, I realised it differed quite a lot from the first version I made, back in the summer. 1) Box pleats sewn the reverse to what was instructed in the pattern i.e. pleating from the right side of the fabric rather than the wrong side. To be fair, this is suggested in the pattern as an alternative so I wasn't being a complete rebel! This is how I made the pleats originally…. 2) Invisible zip used instead of the exposed metal zip which is a feature of the pattern. I'm still on the fence about exposed zips, especially in such a feminine dress. Personally, I think they work better on more robust looking garments. Still, I learnt a new skill whilst making the sample (how to insert an exposed zip), which I'm pleased about, and I think the zip does look good, I'm just not sure if it's for me! 3) Armholes finished with bias binding instead of the self fabric facings in the pattern. I realise that armhole facings need to have a bit of width to them to sit nicely, but I still prefer the neater, trimmer finish when using bias binding. The compromise is that bias binding doesn't give you the seamless finish you get with facings (unless, of course, you catchstitch it down by hand, which has never worked successfully for me). I also added interfacing to the waistband pieces and underlined the entire dress, but that was more down to fabric choice than me being a maverick! They're not big changes by any means, but I'm surprised there were so many of them - in my head, I thought I'd sewn up the dress more or less exactly as the pattern dictated (minus the zip). I didn't think I was such a madam with my sewing! When I first started sewing I slavishly followed sewing patterns exactly as written, terrified of deviating in case it all went horribly wrong. Over time, I've learnt that if a design detail doesn't rock your boat or you know of an easier/neater/faster way of getting the same result, then it's a no brainer to make a few changes to the pattern. Plus, I'm all for putting your own stamp on things! The obvious exception to this is pattern testing, where the whole point of the exercise is that you follow directions exactly to check they make sense. I suppose the more confident you become with your own changes, the more you're inclined to start pattern hacking left, right and centre. Using the bodice from one pattern, the skirt from another and even the sleeves from a third can produce wonderful results! I'm getting there with my boiled wool coat. Despite a slight hiccup, my fabric has arrived and is now prepped and ready for cutting, wahay! The slight hiccup is that the beautiful light grey/blue colour I spent about a month deciding on is no longer in stock. Noooooooo! Dragonfly Fabrics checked with their wool supplier and did their best to get their hands on some for me, but there's none to be had. Once I'd finished crying I went back to my vast selection of samples and had another ponder. I was tempted to go for a one-off bright green or turquoise, but I know I just won't wear a coat that colour. The obvious choice was blue, which is what I went for in the end. 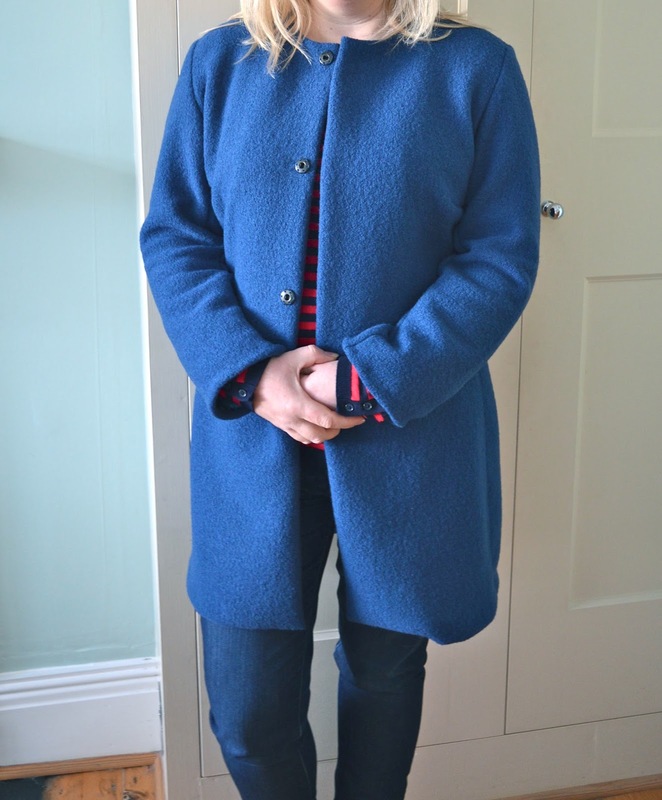 Yes, it's predictable, but a blue coat will work with my entire wardrobe and I know I'll get a lot of wear out of it. In a rare and unorthodox move, I also made a second muslin. I hate making them, and sewing a second one almost killed me, but I'm glad I did as the fit is so much better. I'm sorry I haven't got photos to show you, but my muslin fabric is large scale gingham and I do look exactly like a clown wearing it! All I did for the second one was to scale down to a size 38 everywhere apart from the bust, and shape the waist in slightly. 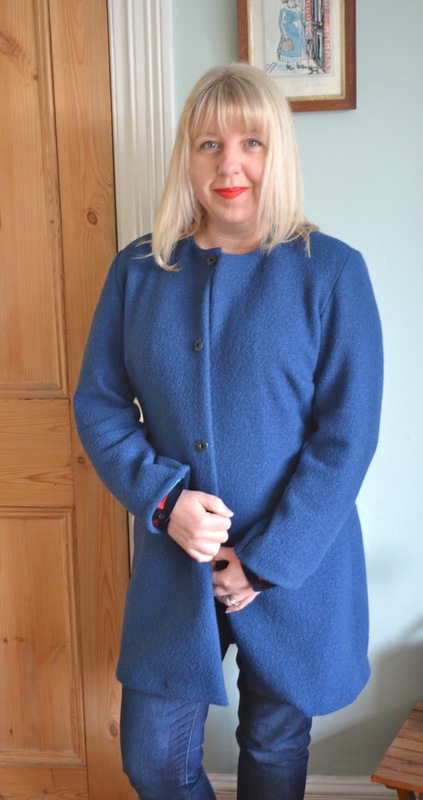 In order to see what other bloggers had done re the button situation (I've decided to use discreet snaps by the way), I researched the Burda pattern and found two gorgeous versions which have really inspired me. One was from Honig Design who made a very chic, two toned version here. The second was from Sandesh at Bedlam and Bird whose beautifully fitted, Italian wool version is lined with Liberty silk. She also emailed me lots of great advice on construction and supplies, for which I'm eternally grateful - thanks Sandesh! I've also picked up lots of great tips for working with boiled wool, some of which were from comments on my last post, so thanks for pitching in everyone! I thought I'd share them here in case anybody else is thinking of working with it. As mentioned before, if you're using boiled wool for outerwear, you don't need to pre-wash it. However, my fabric arrived from Dragonfly Fabrics with instructions on pre-treating the wool before cutting. They advised me to steam iron the wool all over from the right side, without touching the fabric with the iron, then lay out flat to cool. I did as directed, and even though I was sceptical (and nearly died of boredom) it worked! The fibres recovered nicely from being folded and there's not a crease in sight. Some of you also advised me to use the iron sparingly as heat tends to stretch the wool. Flossie Teacakes has written an excellent post about boiled wool here and recommends that you avoid pressing as much as possible. If you must use the iron (e.g. for pressing open seams), then use a low heat. It's advisable to stabilise the shoulders, neckline and armholes beforehand with twill tape, stay tape or armhole reinforcement tape. This will prevent stretching. Use a ballpoint needle and a longer stitch length. Do check first on a scrap though, as all machines are different. If you have a walking foot, now's the time to use it! It will deal with thick layers admirably and stop them shifting about, especially useful on longer seams. Boiled wool doesn't fray, so seams don't need to be finished. However, to cut down on bulk, it may be helpful to topstitch seams down. This is done by sewing the seams as normal, then lightly press them open (see above!) or finger press if you can. Topstitch both sides of the seam, very close to your original seam line. Or you can topstitch ¼" from the seam line for a more obvious topstitching feature. Washed Wool: this is a 50% wool, 50% viscose mix. 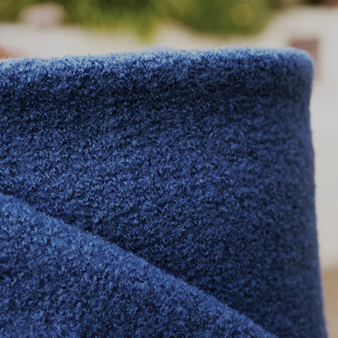 It's a medium weight, densely knitted fabric, similar in appearance to boiled wool. Stocked by Ditto Fabrics in ivory or burgundy. Italian Melton: 70% wool, 30% polyester. This fabric is thick (520gsm), but with lovely drape. Stocked by Fabricuk.com in a variety of colours. The following fabric hasn't been recommended by readers, but it's another cheap option. Loden Boiled Wool: Roughly 70% wool, 30% polyester. Quite lightweight and stocked by Myfabric.co.uk in lots of colours here. 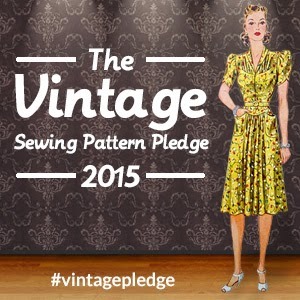 Marie from A Stitching Odyssey has just announced the return of the Vintage Sewing Pattern Pledge for a second year - hoorah! This year she'll be co-hosting it with Kerry from Kestrel Makes which is awesome. I really like the way Kerry has identified her own vintage style niche (1970's/1980's). It's absolutely NOT an era I would ever like to revisit personally (I had to wear those fashions first time round! 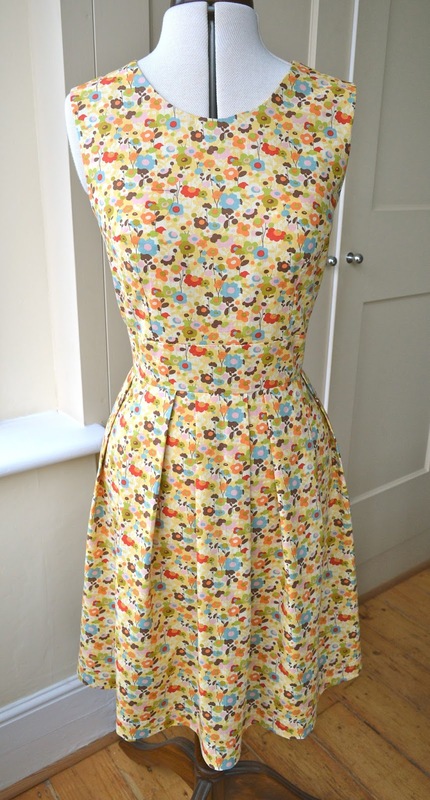 ), but I'm enjoying seeing the garments she makes from vintage patterns of that time. It's well known that Marie is a big fan of vintage patterns from the 1930's to the 1960's, so by joining forces with Kerry they should have all the major decades covered! Thanks for organising it ladies, I can't wait for your inspiration posts. The Vintage Sewing Pattern Pledge was one of the few online challenges I joined in with last year and even though I completed the challenge, I have mixed feelings about committing to any kind of numerical target this year. Just to be clear, I love vintage patterns, I'm fascinated by them and can easily lose entire afternoons reading the instructions and scrutinising envelope artwork. I've also sewn quite a few garments from them over the years (19 at the last count). I think my point is that I like to sew from vintage patterns on a whimsy rather than as part of a self imposed schedule. So this year, I'm keeping my challenge very simple. 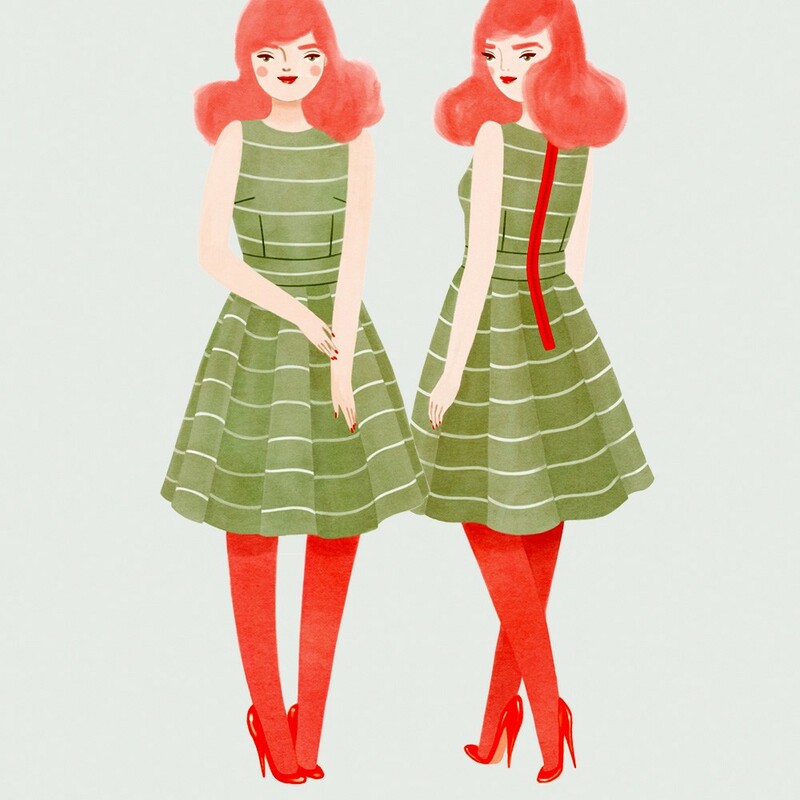 I've got my hands on one vintage pattern that I know for sure I'll sew this year. That's all I'm going to commit to and any extra vintage patterns that manage to get sewn this year will be bonuses! This is it - a 1950's tie neck halter top with gathered bust, that crosses at the back and fastens to the front. Why this particular pattern though? Probably because I've been looking for a pattern like this for years. I'm a great admirer of halter necks (as evidenced here) and I think I'll be able to get a good fit on this pattern because of the gathered bustline. The pattern is an ePattern - a reproduction of a vintage pattern in PDF form - that I purchased from Etsy shop Subversive Femme. Obviously I'd prefer to work from the original pattern, but vintage halter neck sewing patterns are like gold dust, so this is good enough for me - I can't wait to work on it once summer's here. 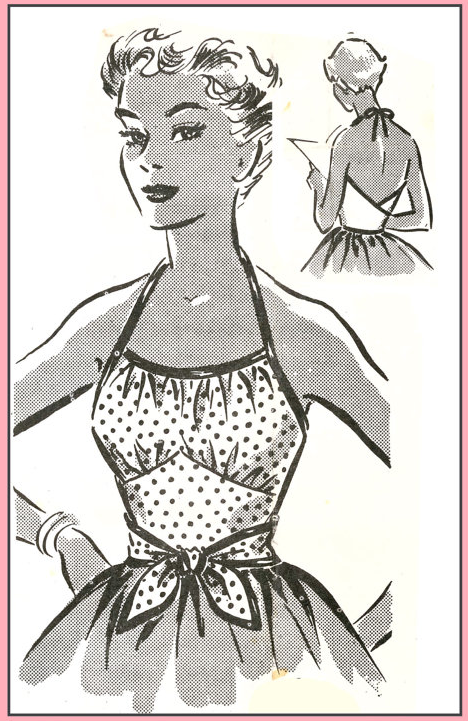 I, Jane Marland, will sew up my favourite halter neck vintage sewing pattern during 2015. - Because of the tightly woven fibres, it doesn't fray when cut, so no need to finish seams. Hoorah! - If you're after a winter coat, you don't need to add underlining or interlining for extra warmth. In fact, if you're after a very simple coat or jacket, you don't even need to line it at all if you don't want to (more on this in a minute). With this in mind, I thought boiled wool would be a perfect choice for my next project: a casual coat/cardigan. Design-wise I had a very simple shape in my head: above the knee and slim fitting with no collar. I was initially thinking of drafting my own, but I've come to the conclusion that I need to practice my drafting skills on a few simple garments first before unleashing them on a coat! 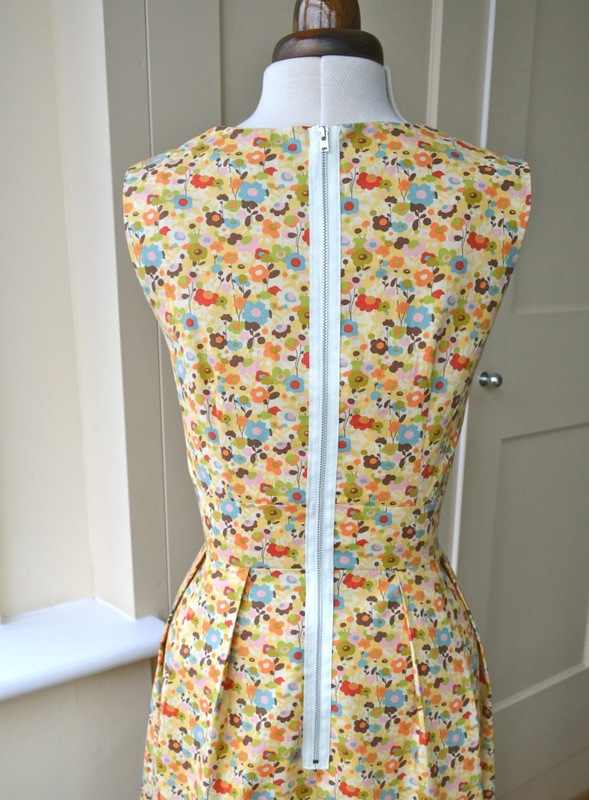 I'm getting there though, I've almost finished drafting my first dress so look out for that soon. As far as inspiration goes, I was rather taken with the Named Patterns Andy Coat. 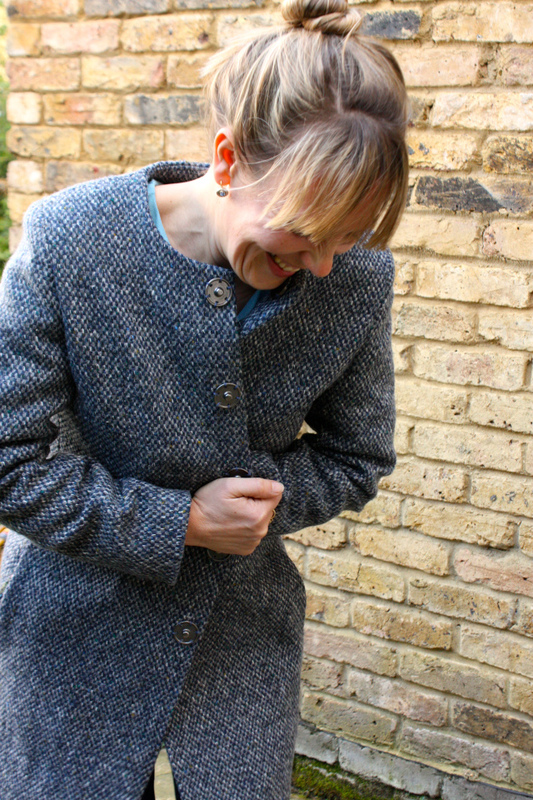 When I met up with Scruffy Badger recently, I was able to inspect her beautiful version at close quarters and was mightily impressed with the tailoring details: bound buttonholes, welt pockets, fully lined, two piece sleeves etc. I was sorely tempted, but to be honest the pattern involved a bit more work than I was willing to put in (I told you I was lazy!) 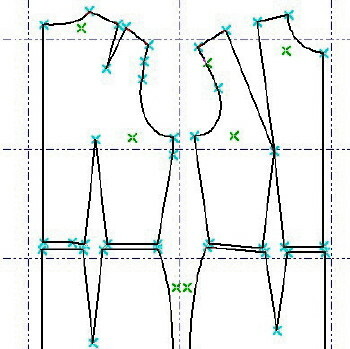 But then I came across this Collarless Open Coat pattern from Burda (03/2012 #110). It's a very simple design with princess seams, two-piece sleeves, centre back seam and no collar. It's also an edge-to-edge style, which means no buttons. I'm not sure how I feel about this - on the one hand it's a casual coat for spring time, so it probably won't need buttoning up, but then again, it might drive me mad not having any. It's a tricky one… it's not totally edge-to-edge, there is a slight overlap, so I may sew on a few covered snaps as contingency. I'll have a think about it and let you know what I decide. Any thoughts? I actually made a muslin of the coat (gasp) - I cut a Burda size 40 which looks just a tad too big all over (obviously the sleeves will need about half a foot chopping off). So I think I'm going to size down all over, take a tiny bit more off the shoulders and shape it in very slightly at the waist. I'll also need to shorten the whole thing by about six inches to get the length I want. Nothing too dramatic, and after that I'll be ready to start working with my boiled wool, eek! The boiled wool I'll be using is from Dragonfly Fabrics who stock a wonderful selection of colours (see first picture) The choice is almost overwhelming so I requested lots of samples to play with beforehand, eventually settling for Light Grey Blue. This photo isn't really a true representation of the fabric colour - it's much more saturated in real life, a lovely airforce blue. Dragonfly Fabrics are very kindly giving me two metres of boiled wool for my coat, so I hope I can do it justice. I haven't worked with boiled wool before, so asked Dorte at Dragonfly Fabrics for advice on pre-washing. She advised against pre-washing for a coat (I'll probably get it dry cleaned in the future if it needs it) but if I was making a dress or skirt from boiled wool then it can be pre-washed. It should be washed on a wool cycle and dried flat, but be prepared for around 10% shrinkage. Although I could probably get away with not adding a lining, I've decided to add one to give the coat more of a professional finish. Having done a bit of detective work in the shops, all the boiled wool coats I saw had lovely, shiny contrast linings, so that's what I'm planning. Happy New Year! I'm rather pleased with my sewing output for 2014, there were a few stumbling blocks along the way (more on that later…), but by and large it was a great sewing year. My favourite make of the year has got to be my Dotted Chambray Bow Blouse. You all know I love bow blouses, I love Mrs Slocombe, I love polka dots and I love chambray, so the amalgamation of all these things almost finished me off. It's not just my favourite make of the year, it's my favourite make OF ALL TIME! I always receive compliments when I wear it too, the bow seems to be particularly impressive for some reason! 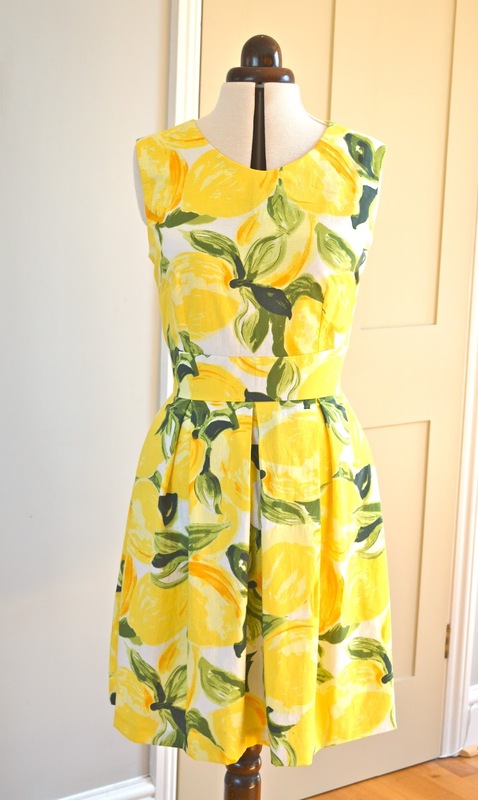 Coming in at a close equal second are two dresses I made in the summer: my Kate Spade-inspired Lemon dress…. They were both inspired by pictures I found on Pinterest (see here and here) and I feel ridiculously pleased that I was able to use the original inspiration pictures to make dresses that were very individual to me. They both fit really well, and although they're quite different in design, I feel they're a good indicator of my style. Plus the lemon dress is yellow - one of the few rogue pieces to step out of line from my strict red, white and blue colour dictatorship this year! The most useful item I sewed this year was my raincoat. I won't lie, it did give me grief during the making of it, but that was all forgotten as soon as I donned my vision in navy blue waterproof loveliness! This year I also discovered the joy of sewing my own basic items of clothing (mostly Bronte T shirts and Mabel skirts). As wonderful and useful as they are, I find them deeply boring to blog about, so if any further versions pop up, I'll just mention them in passing! As mentioned earlier, I did have a couple of misses this year: despite my best intentions, the Cressida skirt I pattern tested for Jennifer Lauren Vintage just didn't work. My first Afternoon blouse has also been shown the door, purely down to the fact that it doesn't fit. It's a real shame as I love the red shirting fabric I made it from, but there's no getting away from the fact that I cut a size too small. That'll teach me eh! And finally, the darts on my vintage red dress defeated me in the end and it's now languishing, dart-less with side seams ripped open in frustration. Maybe I'll come back to it, if I can ever be arsed. I think this year was the year I finally learnt to say no to every single sewing challenge I heard about. It's still a bit of a struggle as my natural inclination is to immediately scream "me too, ME TOO" but life's just too short. I did participate in the Vintage Sewing Pattern Pledge run by Marie at A Stitching Odyssey but deliberately set myself a low target (to sew up three vintage patterns in 2014). The other reason I didn't commit to everything under the sun was because I found myself hosting a sewing challenge of my own - the return of One Week, One Pattern 2014! Although it was a lot of work, I really did enjoy organising and participating in OWOP and was overwhelmed by how many people joined in and embraced the challenge themselves - thank you so much everyone! I loved giving my beloved 1950's Simplicity pattern its place in the spotlight for a week, if anything, it's made me even fonder of the pattern than I was before! As for my sewing plans for 2015, I'm really keen to use the skills I learnt during my pattern cutting weekend to create a well fitting bodice. This kind of thing doesn't come naturally to me, but I would like to get my dart positioning right and conquer the bloody things once and for all. With this in mind, I've got plans to make a simple, collarless coat in the early part of the year. I do have a pattern in mind but I may have a go at self drafting (ahem!) I think it will probably end up as a combination of the two. Other than that I'm going to just sew where the mood takes me, Exciting!